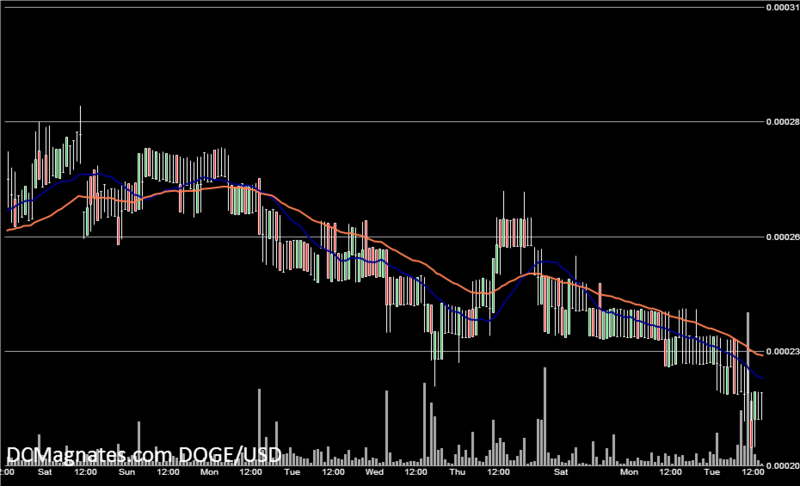 Dogecoin today hit another low of 37 satoshi (=$0.00023). This is the coin’s lowest traded price since prior to its January run-up. A key point of support has thus been broken. Since it peaked near 300 satoshi in mid-February, the coin has been stuck in a near-constant trajectory of decline. The coin is now not too far off from all-time lows set shortly after it was launched. Indeed, the coin’s future is at stake- at least according to Litecoin founder Charles Lee. In a recent post, he argued that Dogecoin’s low hashrate places it in jeopardy, as it would take only a few combined Litecoin mining pools to mount a 51% attack. He proposes merged mining with Litecoin, which itself has faced a recent identity crisis in terms of its own mining. Some staunch Shibe enthusiasts barked back, unmoved by Lee’s proposal and upset over what they perceived as an attack on their coin. In a follow-up post, Lee sought to reassure that he has Dogecoin’s best interests in mind, “Maybe it’s because if Litecoin is my child, Dogecoin is my grandchild (or is it my child’s dog?)”. He also owns a moderate amount of Dogecoin. Dogecoin now has a market cap of $20 million, ranking it 7th among all cryptocurrencies, 5th among those mineable.